Julio and his friend Iluminado, an older, master wood-carver, find ideas in the forest where they gather wood. Musicians, angels, and amazing creatures of all kinds hide in every curving branch. This year there is a contest with a big prize for the best carving in the land, and Julio wants to enter. All through the Mexican village where Julio and Iluminado live, people are saying that the carvings Julio is making for the contest are great. When Julio sees how hard times are for Iluminado, whose eyesight is failing and whose crops are not good, Julio has some decisions to make about friendship and generosity. Years ago, I came across a wooden lion that roared. Simply yet elegantly carved, bright and expressively painted, it leaped at me with a life much larger than the few inches it filled in a window. “Mexico” was written on its belly. A decade later I began to notice other, even more fanciful wooden animals-slinky, curving deer in unusual colors: aquamarine, red, with wild spots and stripes; lizards, dragons, armadillos, a pair of dressed-up cha-cha-ing chickens painted in arrays of brilliant colors that danced by in all combinations of shapes. The woodcarvings were full of life and imaginative forms, and the painting that covered them was as fine as any artwork I’d seen. I wondered who had made these creatures. When I picked up some of the pieces, I saw peoples’ names written on them, and on a few, names of places as well-San Martín Tilcajete, La Unión Tejalapam, Arazola. These are towns, or villages, near the city of Oaxaca, capital of the state of Oaxaca, in Mexico. Having been in the area long before, I imagined the people and the places. A story began to take shape, and I wanted to see and hear the stories behind these seemingly magical carvings. I traveled to Oaxaca, and found artisans whose names I had seen on the carvings. In walking the roads and dirt paths of the towns and villages I met many other carvers and their families. Much of the mountainous state of Oaxaca is not an easy place to make a living. People till and plant fields etched into hillsides with crops that the New World gave to the rest of the world-corn, beans, squash, tomatoes. Basic necessities are often scarce, so large numbers of the region’s farmers leave to ply their trades in the north. Significant numbers of people who work farms, landscape houses and public spaces in the US are from Oaxaca. Those who stay often maintain some traditional ways, though their lives can be a dramatic mix of the old and new. In villages and rural regions, dozens of indigenous languages are still the primary tongues. Kids whose main toy might be a discarded hoop or wheel pushed with a stick along dirt paths go to school in a satellite dish-topped building, receiving lessons and news from afar, as they might too from brothers, sisters, aunts, uncles, parents, in Los Angeles, Chicago, or the fields of Colorado, California, Oregon, Washington. Walking in the hills, where houses are accessible only by path, an area I thought of as remote, an older couple invited me in for the hospitality of a cool drink and pulled out a photograph of their son who lived in Yakima, Washington, a couple of hours from my home thousands of miles north, linking us with artwork as well as geography. Woodcarving in various forms, particularly mask making, has been traditional in the region for hundreds if not thousands of years. A few decades ago, a couple of families discovered that there was some market for small wooden carvings they made, of animals for example, and produced them to supplement income and put artistry to life. Thus the lion that found its way to my studio, and me finding my way years later way to a new generation of the Santiago family that made it. In the past couple of decades many carvers have taken up the craft, and there is incredibly rich diversity of styles and subjects, from the highly imagined to images drawn from local life-creatures from outer space to saxophone-playing alligators and bicycle-riding zebras, angels, processions of village dancers; painted with the luminous spots, stripes, and variations of every geometric shape. In several villages this craft has become a major part of the economy as well as an art form. Men often carve, and families sometimes sit close doing the exuberant painting that covers the surfaces, children picking up tips from and adding their own innovations to the work of older artists. A number of carvers do the painting themselves, and there are women who carve. Perhaps like any successful artwork, exciting to see, the best carvings are likely to come from passions of the carvers. For an artist, for anyone, having a mentor, a spirited guide who can teach skills as well as help in finding how to tap into the inner worlds from which creation leaps, can be a treasure. In high school, an art teacher reawakened me, along with numerous others, to the reality that anyone can create. At about the same time, a white-haired science teacher drew animal caricatures on the board to literally make science talk, and a similarly wizened language arts teacher delved into books like everyone could get inside them. In my family, several older members were great storytellers and we would sit and swap stories, which came to bright life like these carvings. One of my grandfathers would occasionally write a letter to me, and on each he drew a similar, simple though charismatic bird, helping plant the idea that art can add richness to anyone’s life, young or old. 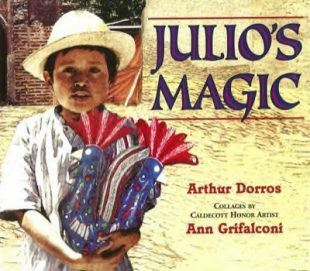 In JULIO’S MAGIC, Julio learns carving and more from Iluminado, an old carver who is, like many of the carvers I met, closely connected to the land, its creatures, the creative process, and openly expressive in the lively artwork each creates. As well, like many, even if relatively poor in material possessions yet generous people, Julio places real value in his relationships and the people around him.